This dystopian essay from Austrian director Nikolaus Geyrhalter is a portrait of the world after the last human being has been annihilated. Consisting of wordless, textless scenes of abandoned hospitals, churches, office buildings, roads, nuclear testing sites, military installations, and amusement parks, the pointed visual commentary of Homo Sapiens states, unequivocally, that we are unnecessary and easily forgotten, an infection that Mother Earth has finally eradicated. What’s left behind is the effluvia of a nothing race, our monuments to progress and growth and technology and mindless entertainment crumbling into dust or devoured by plants. We watch, via the director’s locked-down camera, the process of decay, of surrender to nature’s fundamental processes. Vegetation consumes a coke machine; water floods an empty chamber; the wind lazily blows paper around an office. The camera sits motionless and stares, like the eye of a compassionless insect. Without any of the comforting handholds of narration or words or music, we are helpless to argue against the pure folly of our existence. We are mute observers of our oblivion. There is melancholy in these images, as monumental as they are; an unsettling feeling of tragic loss and miscalculation. Yes, the movie confirms, we have no one but ourselves to blame. 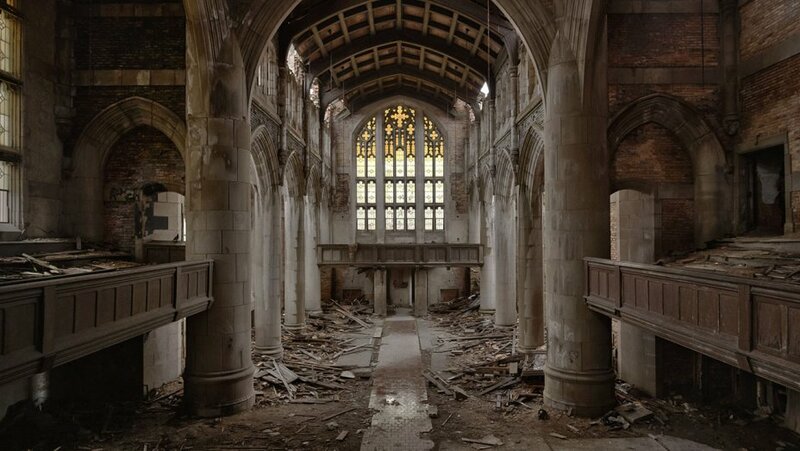 There is a rhythm to Geyrhalter’s assemblage. Each shot seems to be more decayed than the previous one, each advancing image suggests a longer absence of human presence. One year? Ten years? A hundred? The movie begins and ends in the same location, a Taj Mahal-like interior in the Buzludzha Monument in Bulgaria, the murals still visible and vibrant when the movie begins, more tarnished and scuffed when it ends. The film invites us to consider what the remnants of humanity will look like eons from now when discovered by an alien explorer. The locations are astonishing, particularly a massive roller coaster on a barren coast, the tide slowly inundating it. Geyrhalter spent five years scouting and gaining permissions to shoot. He had to keep many sites anonymous. The surrounding sounds–birds, rain, insects, sheets of metal and plastic banging against furniture–were all recreated in a studio only because man-made sounds kept spoiling his location audio. And many of the images, on first appearance to be entirely naturalistic, were enhanced with additional lighting, wind machines and pumped-in water. Homo Sapiens is documentary science fiction, a supremely disquieting epic vision of ruin and surrender. It will disturb your dreams.